the SITE PLAN The site plan indicates the ideal orientation of the home on the proposed site. The service meters needed by the home in order to have access to the local grid and its resources are also present in the siteplan; such meters and access units includes water, gas, power, sewage and telecommunications. Melbourne is registered to be part of the Zone 6 in terms of the Australian Climate Zone Register, which is said to have a mild temperate when it comes in terms of wind speed and direction, as well as temperature levels. There are also different codes and building regulations regarding each zone, so from this point on, each design element has been measured against the codes and requirements placed for Zone 6. Placed north for optimum usage of sun for drying but trees are planted around for hiding it. *Sun Path Information calculated through the use of the program, Solar Tool. Pergola Roof Structure that allows for deciduous vine growth. Details to plants chosen in Passive Thermal plan. *Wind Path Information EP obtained from the Bureau of Meteorology, from the nearest study location to client’s desired suburb, Melbourne Airport. Results are read at an elevation of 113m above sea level. There are several things the client wishes for: - A koi pond in the backyard for the kids - A vegetable garden for Violett - A barbeque/grill permanently installed in the backyard for Bennett. - Entertainment space for the extended family and friends outside the backyard. Lawn area for kids to safely play in. - A water tank system big enough to provide for the family’s needs in the kitchen, bathroom and laundry. Kitchen sink is to be connected to the mains as an exception, on request from client. - Kitchen stove needs to be in the middle of the kitchen island bench as per filming needs of the client for her show. More lights also needed in the kitchen area. - As per the previous points, the clients have agreed to install in elevated hardwood floors in order to allow ease of access to services and to allow services to be installed easily underneath the floor system. Therefore, effective insulation and heating systems needs to be installed inside the home. (All specifications in the following design plans will be catered to this area) Father of the Miller Family. Works in an office during the weekdays. Takes the car to the station to commute to work by train. Loves to hike at the local park, Brimbank park along with his family. Loves a good outdoor backyard BBQ. Mother of the Miller Family. Works at home as celebrity chef filming her tv show. TV Crew comes to film her. Great natural lighting required in home. Wants to use locally grown vegetables in show. (Vegetable garden required). Daughter of the Miller family. Son of the Miller Family. The orientation promotes optimum results when planning for energy efficiency and for use and collection of natural resources such as rainwater and solar power. Deciduous trees to be planted on north boundary to provide shading in the lawn area and vegetable garden during summer months. Client wishes to use pebble paving concrete provided by NewDawnTM to pave their permeable driveway. Illustration on the left shows how their permeable pebble paving system works. Masonry to be completed with the use of CSR Hebel Panels (PowerClad, 215mm). The house plan allows us to communicate the layout of the home in terms of furniture, doors and windows. It also allows us to see the plan and location of rooms within the home. The minimal standard wall R-Value listed for Melbourne is 2.8. This wall design is said to achieve an R-Value of 3.57 in winter and an R-Value of 3.31 in summer, according to the Hebel Installation Guide. Adding on the R-Value of the K18 Plasterboard, the total R-Value of the property’s wall system is 5.57 in winter and 5.31 in summer. The average R-Value is 5.44. Using Code: Hebel 1507, requirements for the wall system are as follows. Steps made according to Australian Private Safety Standards. Timber Flooring to cover the rest of the floor plan. Fixed W-12 850 x 400mm These windows are located above the drawn windows on the plan. There are 4 adjoining ones alone W-11 and 6 along W-12. Window Types set to TIM-006-03 W, which are Double Glazed Timber Windows, with an Argon Fill, which results in a U-Value of 2, as well as Joists are spaced to the a high solar gain and a low e-value standard 450mm and with a clear finish, which results in a are designed through the use of steel universal SGHC of 0.31. Reasons for the use of a high solar gain windows are because beams to be able to heat are desired in the areas during the withstand the building load. winter months, but the windows are well shaded during the summer months W-08 due to the deciduous vegetation. All windows with openings are to have fly-screens installed as well. External Foundations subject to rendering. Gas Stove moved to the island bench to the request of the client. Trombe Wall Details can be found in passive design, heating and cooling plans. Services and Ducted Air Vents are to run alongside the roof’s truss frame. Warren Truss made out of lightweight steel for roof support structure. Masonry Wall placed inside the property to achieve thermal mass during the year. A suspended timber flooring system will be used for this project to create space for services and for easy installation. The property should be able to achieve cross-ventilation practices as the ceiling height (2480mm at the lowest point and 3100mm at the highest point) and the open plan living area’s length (13.8m) are in a 5:1 ratio needed for cross ventilation. There are also several entrances around the home, as well as exits for the hot air to be flushed out by incoming cool air, that are shorter in distance than the given 13.8m. The Passive Design Plan outlines the current strategies applied to the home in order to create minimal use of active heating and cooling systems. Deciduous climber plants to be planted on the northern facade with built in framework to provide shading during the summer and access to the sun during winter. See sun diagrams to the right of page. The sun diagrams listed on this page show the direction of the sun during the day. Through the ample use of windows around the property, this home obtains a lot of sunlight during the day while having proper shading needed to redirect any direct sunlight. This answers the client’s desire to have plenty of natural lighting throughout their property. Koi Pond and natural filter provide a sort of outdoor thermal mass cooling to the northern and eastern facades of the home. 76 degrees is known to be the angle of the sun during the summer equinox. Deciduous trees on the eastern side of the property provide shading to windows 10 and 11 in house plan. Northern breezes may also enter from the northern windows of the property, but it will be slowed down due to the deciduous trees planted at the north of the property. See information below for the type of deciduous tree that if planted. This angle shows what that would look like visually and the diagram to the left show how that will affect the client’s home. sun diagram - winter 28.5 degrees is known to be the angle of the sun during the winter equinox. The trombe wall contributes to the home’s passive design strategies. Details to the trombe wallare found in the heating and cooling plans. Breeze to enter through louvres shown in the house plan east elevation drawing. There are several brick walls inside the property, including the trombe wall. These walls will be greatly affected during the winter time and be subject to the suns rays as the summer shading devices will be gone (deciduous vegetation or adjustable shading types) and the walls will be exposed to the sunshine. These should achieve thermal mass activities and heat up the home during winter. This plant was chosen to be the trees on the east side as they have a small overall diameter (4m) and can fit on this side of the property. An adjustable louvre like this one is to be placed on the western window, but it needs to be custom made to fit the window specifications listed in the house plans. It also needs to be adjustable so that shade could be provided during summer and so that the sun could have access to the room during the winter months. This plant was chosen to be the deciduous vine that will be planted for the shading strategy at the north of the property. They are categorized as deciduous vines and also emit a lovely perfume smell of jasmine through the property as northern winds pass through the property. The electrical plan lays out the lighting fixtures inside the home, as well as devices that need an electrical input like smoke alarms and service system pumps. 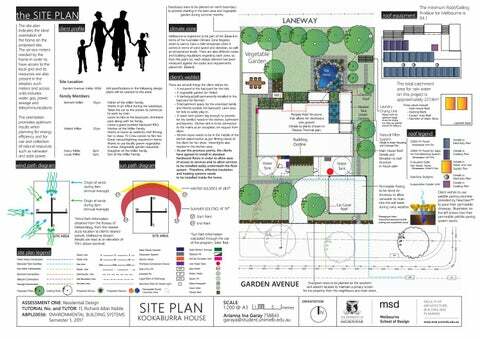 This plan will also layout an indicative solar profile as well as the system requirements and layout. Exhaust Grills are installed in shed for cross-ventilation in accordance to guidance data on YourHome.gov for storing systems outside the home. solar power system specifications The solar power system that is going to be installed in this house is a 5kW monocrystalline system that includes 20 solar 250W solar panels, along with a 17kW Tesla Battery Storage. The system also produces 17kW of power daily. PV Panel This globe is also going to be used for the SolaTube skylight lighting fixtures. GE Tiny 12W ES GLOBE Max Wattage: 12W CCT: Warm White Brightness: 800 Lumens Bulb Type: CFL The unit does not exactly come with the globe, so this globe will be installed instead. Switch placed here for adjustable louvres. Maintenance shed to be built (2x2m) to house all electrical devices, as there is no room in the house. Section shown to the right of the page. This lighting fixture was chosen to be installed as the outdoor lighting fixtures on request of the client. All light switches contain dimmers on them to cause the lights to dim to the clientâ&#x20AC;&#x2122;s needs and specifications. All calculations done on the page will be according to the light fixtures maximum wattage, so light wattage when dimmed down will equal to calculation values being lower. EM SB SPI PCD W.E. SolaTube information in Passive Design Plan. This wall mounted light was chosen to be the ones installated for all the indoor wall mounted lights and fixtures. It was chosen for its design and for its functional purpose of being an adjustable reading lamp, as well as its ability to be dimmed. This simple diagram shows the direction the electricity moves towards power creation in the home. When the system and the battery becomes full, the electricity gets fed back into the grid. Details to the system are listed in the the cooling plan. Solar Panels are to be placed and adjusted to a 45 degree angle on the roof of the property to optimize the suns rays all year round. All areas around the house (in exception to water catchment roof areas) are effective in returning rainwater back into the soil quickly, as most of the surrounding areas are made of grass, while the entertainment areas are The water and gas supply plan provides insight into the cold and hot water connections, surfaced with permeable concrete (PebblePave), and where they come from. The plan also includes information about the hot water and there are also the natural garden filters system, the rainwater collection system, as well as gas connections for the property. and the koi pond as well. The only sink with a pure mains connection is the kitchen sink, as requested by the client in the site plan. Bladder Tank dimensions are specified and made to the spacing under the deck, but through using the siteâ&#x20AC;&#x2122;s calculator, a bladder tank of approximately 6,800L may fit under the deck. The hot water tank is decoupled from the roof system and the storage unit sits in the services area. tanks for the water supply system. All systems gas related are separated and placed on the right service area so that they are far away from the electricity services. They are also piped and connected underneath the home in its floor cavity to avoid having piping close to any electricity systems. rainwater collection calculation The total roof area worked out for collection area is approximately 140sqm for the main household roof, and approximately 91.9sqm for the carport, verandah and tank roofs. The average daily use for the home was calculated to be 360L/day. 27,000L Round Steel Tanks Dimensions are 3040mm in diameter and 3010mm in height. It comes with filter and a pump and you can also collect water from the roof of the actual tank, adding to the rainwater collection area. Hot Water SolarTubes are also placed at a 45 degree angle alike to the Solar Power System from the electricity M plan. 6,800L Bladder Tank Dimensions are subject to decking space, but system also comes with a filter and pump. The Water Recycling and Drainage plan provides the information needed to place the piping and vents, as well as the gradients at which the main sewer pipes go. This also provides information on natural or active systems you can use to recycle water from the house to reuse again in toilets and for watering the garden. The slope of the sewage system is extremely important in that the gradient of system must be in the ratio of 2:100, or in the case of these calculations, 2cm per 1m of piping. This greywater system was made to assist large homes (3+ bedrooms) with their water recyling needs. Albeit the fact that the clientâ&#x20AC;&#x2122;s home is within the range of a small-medium sized home, a lot of their water usage (360L/day) can be converted into greywater and be used to water the gardens and to flush the toilet. This greywater system will recycle a maximum of 120L and since this water will be constantly used daily to water the expansive garden area around the home, the limit should be adequate. In the case that this limit is filled, there is an overflow connected from the system to the natural filter on the east side of the building, leading to the koi pond in the backyard. After 24 hours, all the remaining water inside the greywater system will be automatically dispersed into the sewage pipe system. This is to prevent bacteria from accumulating in the system and affecting the water that will be used. The system all elements needed in a greywater system, including a large filter as well as a pump to release the water out. The overall piping length of the home from the highest sewage point to the sewer vent is approximately 19.5m, therefore the overall height of the slope from the highest sewage point to the lowest (sewer vent) is to be 39cm. To be safe and to let the waste flow faster, the ratio is to be upped to 2.5cm per 1m, resulting in a gradient slope height of 48.75cm from the highest to the lowest point. The two pictures on the left provide insight into the excavation method of the koi pond and the possible finished product. A HydroVortex System is needed to be installed at the end of the natural garden filter (Aquaponic bog filter) in order to move water to the koi pond as well as clean it. The trombe wall was installed in the living area to be the main form of passive design and passive heating system for the home as most of the time, the clients and their children spend their time in the open plan living area. The heating plan shows the active and passive systems installed to heat the home during the cold months. It pertains information regarding the system chosen and the connections the system needs within the household. The clients do not mind having to adjust the vents in the trombe wall system in order to achieve either heating or cooling in their home. They are energy conscious and believe that since Violett Miller is home most of the time and cooks for a living, the overall heat of the room should rise as the kitchen range and oven contributes to the heat dispersal. The clients are also prepared to dress appropriately indoors in cases where the weather might be colder than usual. In the event that none of these solutions work, the clients will then use the hydroponic panel systems as well as the woodfire heater if the passive heating practices do not achieve the desired temperature. active heating system The heating system chosen for this home are hydronic panel heaters which source their water from the hot water storage tank, which contains water heated through the use of a solar water heater with a decoupled system. But only when the Trombe Wall is not enough to heat up the house. The wood that is to be used for the woodfire heater in the living room area can be obtained around the site. This is due to the fact that there are many trees around the property, most being deciduous trees in the north and east of the property, and a few evergreens at the front for privacy reasons. 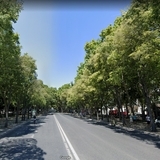 These trees require maintenance, which the clients don’t mind doing themselves, or if they are busy at times, they will hire a gardener and some of the wood needed can be obtained through this maintenance. water panel heaters Hydronic Radiant Panel Heating HYDRONIC PANEL HEATING PROPERTIES: - Response Time: Approx. 30mins - Has low maintenance requirements - Control valves at every panel for zoning purposes. - Uses clean energy, with no use for coal or gas, only hot water. - Depending on the room, it can be customized for areas, even those with high or low ceilings. This system is to be installed in the master bedroom. This system is to be installed in the kids’ bedrooms as it is a safe system to touch and the kids’ safety are one of the client’s main concerns for this heating system. Designer Panel Heater This system is to be installed in the main kitchen area as that area does become part of the filming scene and therefore needs to be presentable when videod. This system was installed on request from the client. As explained before, the woodfire heater will only be used if the other systems, both active and passive, are not enough. JetMaster Universal Insert Wood and Gas Fireplace This system is to be installed in the main living area. An evaporative cooling system should work within this climate as the climate around this area is listed to have hot and dry weather during the summer months. The dry aspect would be the one most important to the The cooling plan shows the active and passive systems evaporative system as it takes moisture from the air and installed to cool the home during the hot months. cools to create cool air. It pertains information regarding the system chosen But if the area’s climate were to be hot and humid, the and the connections the system needs within the system would not work due to the excess moisture in the air. household. Once again, the trombe wall was installed to become the main form of passive design cooling in the home besides the cross-ventilation practices listed in the passive design plan. If it becomes too hot and the trombe wall is not able to cool the main room down, then active systems, such as the evaporative cooling system, fans and solar air conditioner will be able to cool down the home. The home is also heavily shaded in its design and most of the sun’s solar rays should not be able to enter the main living area. Through detailed shading design and the house layout, the client should be able to enjoy their property without having to turn on any active systems for most of the day, on the exception of the fans, which cost approximately 4cents/kWh to run, ultimately saving the clients money in the long run. SOLAR AIR CONDITIONING PROPERTIES: Comes with 4 x 250W Panels. Needs to be installed the roof. Only runs on 10cents per day. (According to site specifications). It is easy to install and is very low maintenance. Details of the location of the solar panels for the solar aircondtioning unit are in the Site plan. Details of the angle they are mounted at is in the Electricty plan. This is a split evaporative system that is zoned between two main areas, the open plan living area consisting of the kitchen, dining and lounge room, as well as a bedroom zone. Low running costs compared to reverse cycle air conditioners. An underground heatwave bunker would be a very useful addition to a home if th area suffers from heatwaves, like Melbourne. The underground temperature of Melbourne under 1m would be between 16-18OC, so the room would always be around the same temperature. This would be very useful if a major heatwave were to happen and it were to occur for two weeks. The residents would be safe under here. natural filter pool A pool is always a good way to tackle a heatwave and a natural filter pool will be a proficient way for the clients to have a pool and to still be environmentally conscious at the same time. Flooding is not likely to occur in this area. Even if the world’s polar ice caps melted, according to National Geographic, the sea levels will rise 65.8m, but the elevation of the property is 81m high. Power Outages The site already has a very proficient solar power system that creates more power in a day than the client’s usage needs. To survive a power outage, simply another battery should let their power last a few days. Proposed Underground Cooling Bunker Proposed Pool Cross section the natural pool, with a submerged pump house on the left. water filter straws LifeStraw Steel In the event of a serious drought and drinking water is not readily available, purchasing a few LifeStraw Steels would enable the clients to drink the water from their pond, natural filtration system or even pool. If there is water left in the rainwater tanks, this water could also be filtered by drinking throught the LifeStraw. On a side note, if extreme droughts were coming, the client could also install a few more water tanks around the property. The pool will be linked to the current koi pond and natural filter, but it will need a grate in the middle to prevent the fish from coming into the pool. With its connection to the current system, there is a chance that the water will already have been filtered the natural way, so that the submerged pump won’t have to be used much.